Cherry House is a spacious, contemporary detached holiday home quietly tucked away in the highly sought after coastal village of Thornham. This is a lovely light and airy house, used as a much-loved family second home. There's plenty of living space with a fabulous, well-equipped contemporary kitchen, sitting room and a separate play/TV room. This is a perfect house for two families to share or for three couples, having four lovely bedrooms (which are all upstairs), two with en-suites and a large family bathroom. Ideally located in a prime location with an attractive fully enclosed lawned garden, within walking distance of the sea, children's play area, tennis courts and a great choice of excellent places to eat/drink which include The Lifeboat Inn and Thornham deli. A travel cot is available at the property. Entrance: Spacious hall with coats cupboard. There is a fabulous kitchen with underfloor heating, which is light and airy with glazed doors opening out to the garden. Kitchen: a contemporary kitchen with painted units and granite work surfaces and finished to a high specification. There's an integral double electric oven, integral microwave, large induction hob with extractor fan, fridge/freezer and an integral dishwasher. There's a large central island and is well-equipped with all the necessary kitchen equipment as used as a private holiday home to date. There is a wooden dining table which may be extended to comfortably seat eight, with eight matching chairs. Laundry room: with a washing machine, sink, additional cupboard space and door to garden. Sitting room: lovely spacious room with glazed doors opening out to the garden and a feature exposed brick fireplace housing a wood-burning stove. Beautifully presented with contemporary coastal decor with two large comfy sofas, snuggler chair, coffee table and occasional lamp tables, large freeview digital TV, DVD player. Play room: perfect place for the young with a good selection of children's toys, sofa and TV. The wooden staircase leads up from the hall and is not steep with a hand rail. Bedroom 1 light and spacious room with a super king-size bed, bedside tables and lamps, chest of drawers, TV and a dressing area with plenty of clothes storage space. En-suite bathroom: contemporay spacious with a walk-in shower, vanity basin unit, WC and heated towel rail. Bedroom 2: another spacious room with glimpses of the sea. Contains a king-size bed, bedside tables and lamps, built-in wardrobes with shelving and hanging space. 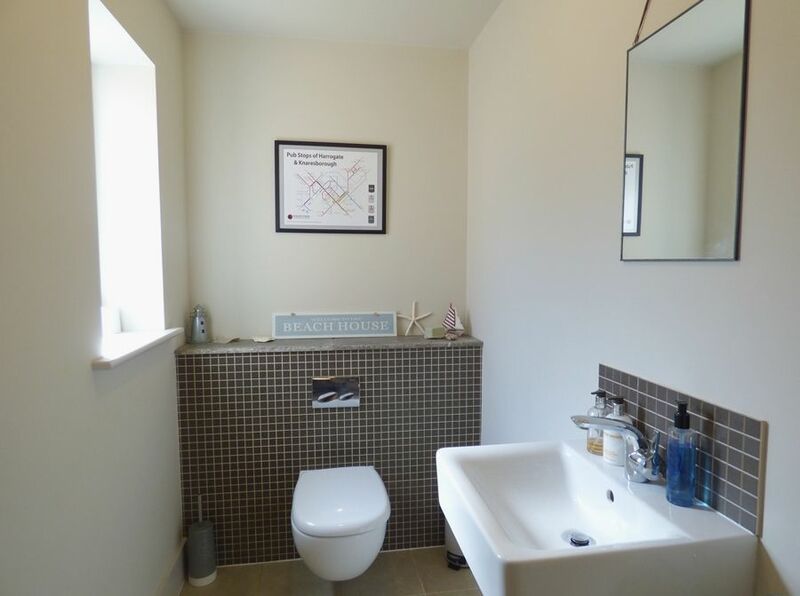 En-suite shower room: contemporary walk-in shower, vanity basin unit, WC and heated towel rail. Bedroom 3: smaller room with a king-size, bedside table and lamp and a dressing table with stool. Bedroom 4: children's bedroom with full-size bunk beds and a separate small child's bed. Please request if this bed will be required, as this will not be normally be made-up. Family bathroom: Large bathroom with a bath, separate walk-in shower, WC, hand basin and heated towel rail. Cherry House is ideally located, tucked away in the far corner of Ploughman's Piece, which is a select cul-de-sac located off the coast road in the popular coastal village of Thornham. At the front of the house is a shingled drive, with shrub borders, and large shingled parking area where there is parking space for up to four cars. The rear garden is well-maintained and fully enclosed, being mainly laid to lawn with a range of mature shrubs and plants, with patio areas and outside furniture for 8 guests. There is a charcoal barbecue. 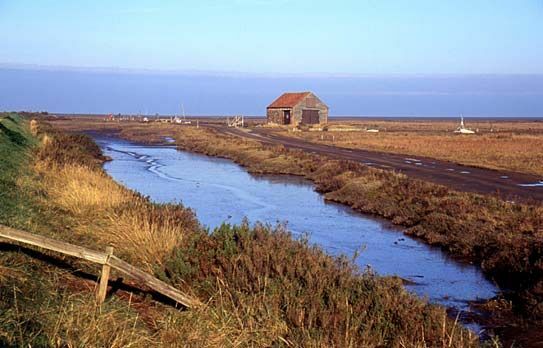 It's a short walk to the Norfolk coastal path and the scenic walk across the marshes to Thornham's gorgeous sandy beach. Guests are spoilt for choice with excellent local places to eat and drink within a short walk away, including The Lifeboat Inn and the award winning Orange Tree pub. It was spacious for 6 Adults and 3 children,the kitchen lay out.The toy room for the 3 boys was great We would always recommend Sowerby&apos;s as the houses are of such a high standard. The playroom was a huge hit with our toddler! The beds were big and comfortable and the style of the house was beautiful. Very well furnished and equipped. We really enjoyed our week in this very comfortable house. Thank you. The cottage was absolutely lovely.